What it’s about: Sometimes we have a longing for something that is simple. There are two kinds of simple I suppose. One is mindless and easy, while the other is poignant and sweet. Cannery Row is the latter. A short novel by John Steinbeck, the book tells the simple story of the California town of Monterey, a center of sardine tinning. Despite the title, none of the main characters are involved in the canning industry. Doc is a marine biologist who acquires animals for laboratories. He has a special fondness for classical records, burgers, and beer. Across the road is Lee Chong’s grocery store and next to that the local whore house. Up the hill live Mack and “the boys,” a group of drifters who take up odd jobs to earn enough for whiskey and food each month. Mack and the boys get it into their heads that something nice should be done for Doc, and resolve to throw him a party. But the execution is shakier than the conception. The boys set out on a frog collecting expedition to gather the money for the festivities and though their intentions are good, the outcome is likely to be a disaster. The whole cast of characters fall into the preparations for Doc’s celebration, for better or worse. 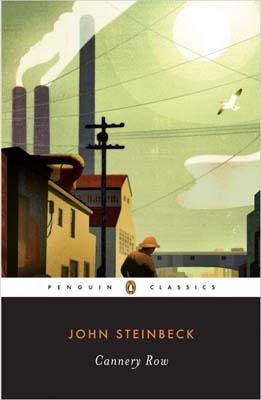 Cannery Row might be seen to follow in the vien of Steinbeck’s most famous portrait of America, The Grapes of Wrath. Row is much shorter, however, and necessarily more focused. Mack and the boys are certainly funny–swerving only slightly off the road to run over a loose chicken, trading frogs for bottles of whiskey at Lee Chong’s, employing so many methods of training their hound that she never learns a thing. They are meant to be both a cautionary tale and an ideal. They are truly the heart of the story though. Their devotion is sweet and intentions are good, even if on the surface they are just a group of bums whose actions are likely to result in property damage and spoiled goods. Would I recommend? Maybe. Steinbeck’s style won’t appeal to all. If you liked Grapes of Wrath or Of Mice and Men, you’ll certainly enjoy this and find it a much quicker read as well. If you’re new to Steinbeck, this book might actually be a good gauge as to whether you should dive into any of his more well known novels. It doesn’t have any of the dark gravity of the books I’ve mentioned, but it certainly has his voice and it’s a great showcase for his humor.